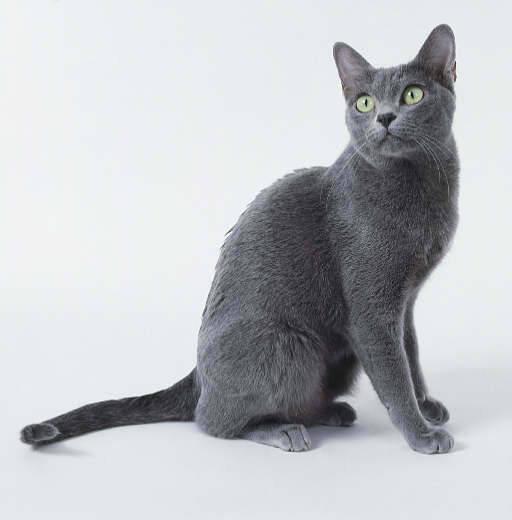 The Korat (pronunciation- ‘ko-RAHT’) is a domestic cat originating in Thailand known for its unique bluish-gray short coat which has a distinct silvery gloss. 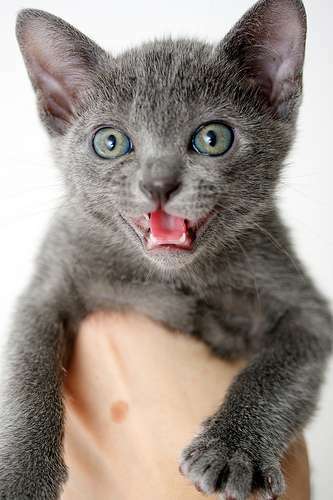 Closely related to the Siamese cat, Korats are characterized by a sturdy, compact body with large green eyes, long whiskers, and a heart-shaped face. The Korats have probably been indirectly mentioned in a book related to cats which dates back to the Ayudhya period of Thailand (1350-1767). Locally known as the ‘good luck cat’, these cats were given (and not sold until recently) as gifts usually in pairs. 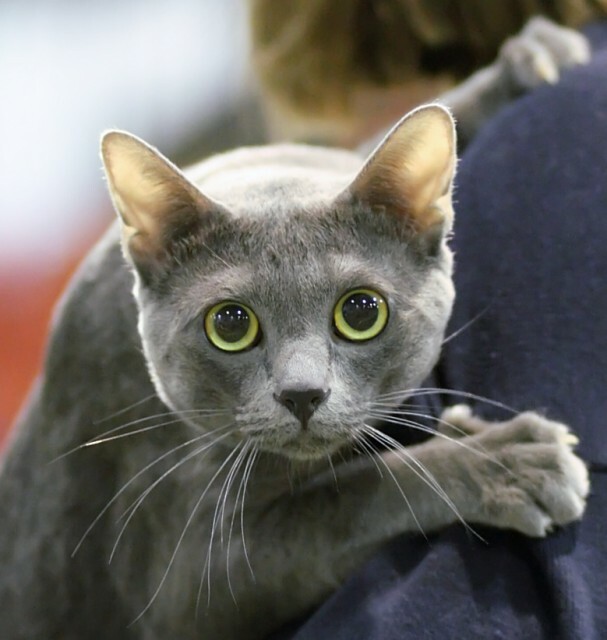 In 1889 and 1896, when the korats were first taken to England as ‘Blue Siamese’, they couldn’t gain recognition by the judges at the cat shows, since it failed to correspond to their breed standard of Siamese cats. The korats, hence, disappeared from England by 1901. In 1959, the first pair of korats that appeared in America was imported by Mrs. Jean Johnson. She was gifted the pair of Korats after the retirement of her husband from Foreign Service in Thailand. 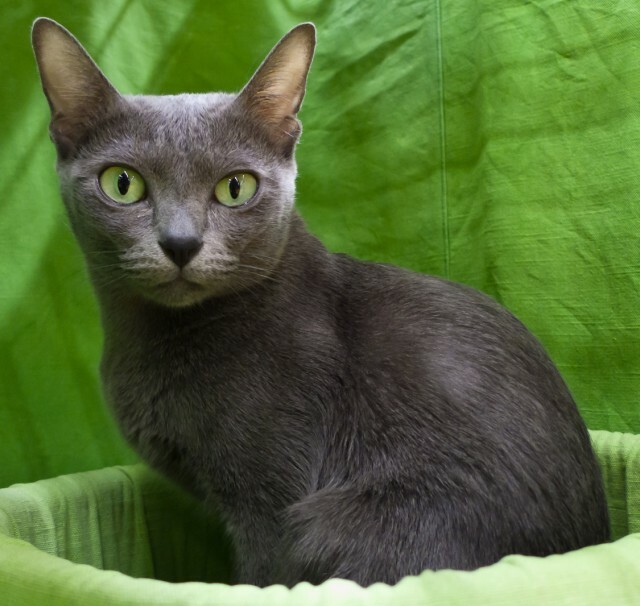 Thai Lilacs: The solid lilac cats with a hint of the silvery shimmering coats characteristic to the original korats. 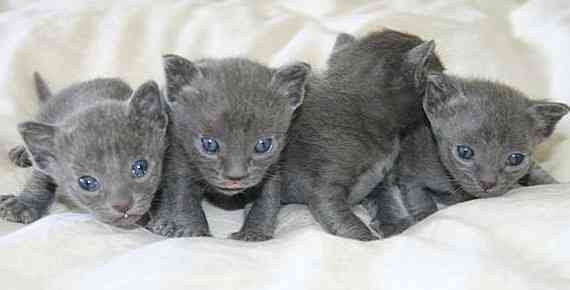 Thai Blue Points: Shows the color-point pattern typically seen in the blue point Siamese cats. 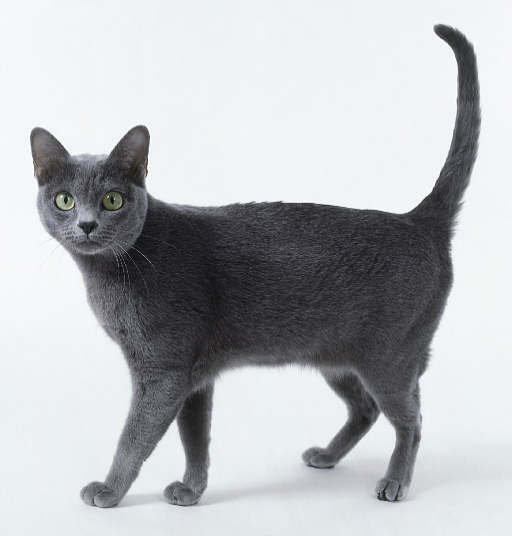 Although direct descendants of the korats, the two variants are not known by the same name as the term ‘korat’ only applies to the bluecats from Thailand. 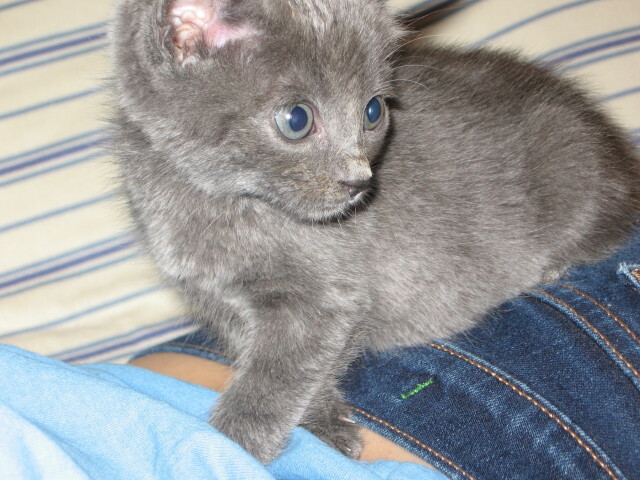 Korats bond strongly with its owners, including children, and loves to cuddle and be around them. These cats are very playful but are still gentle with smaller kids. 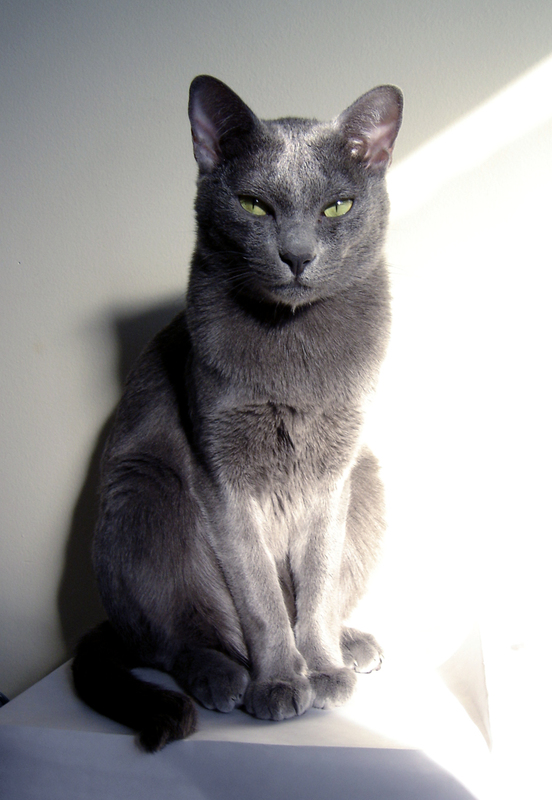 Korats are known to be dominant and demand constant companionship and attention from the owners. Due to their dominant behavior, they might not get along with other dominant pets in the house. 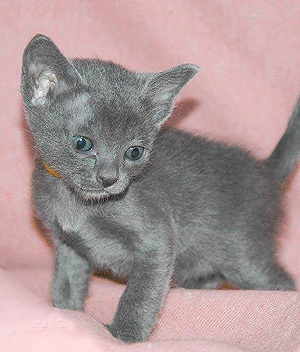 Early socialization would save a Korat owner a lot of future headaches. Although they are quiet by nature, they are good at expressing themselves using their body language. They are confident and highly intelligent, although may get easily startled by loud noises or sudden movements. With a keen sense of smell, hearing and vision, they can find out almost anything ‘hidden’ from them – from food, to escaping insects. Being a generally active breed, they do not need any specific exercise regimes. It is recommended to have a cat tree in your house and let it play with plenty of puzzle toys. Their strong hunting instincts would make them run after whatever is thrown at them. Being a minimal shedder, they require minimal grooming except during the shedding season. Brush their coat at least once a week with a soft-bristle brush. Bathe the cats only when it is really dirty or when you are taking it to a show. Using a blue shampoo (for white cats) is recommended. Cats tend to scratch, although the korats are not aggressive, consider trimming their nails at least once a week. Brushing their teeth weekly (if not every day) would ensure optimal dental health. Wipe the corner of their eyes whenever you see a discharge, but use two different clothes for the two eyes to keep away possible infections. Keeping your pet inside your house would help it stay clean. Otherwise a hardy breed, Korats are known to be prone to the life threatening hereditary neuromuscular degenerative diseases, GM1 and GM2 gangliosidosis. A genetic test is believed to have made it possible to eradicate the condition in 1998, by identifying the carriers and removing them from breeding. However, it is still recommended to make sure that the test has been carried out successfully before buying or adopting a kitten. Some individuals may be sensitive to vaccinations while other common health issues like obesity and tapeworms may also affect them. Having low body fat, these cats are not good at absorbing anesthesia. Being quite ready to please their masters, korats are easy to train, adapting themselves readily to simple trainings like fetching a ball. It is recommended to be gentle with your pet during training, with a loud ‘no’ or a single clap usually being enough as negative incentives. Do not forget to give them occasional treats when they do something good. They are not picky eaters, and do not usually require any special diet plans. With their naturally lean appearance, they do well on nutritionally balanced, high-quality cat food. Raw and fresh foods, such as egg yolks and grated cheese, may also be added to their diet after consulting a vet dietician. Like other cats, korats may also occasionally crave grass. Chopped spinach or powdered alfalfa may be mixed with their food as a substitute. A native from Thailand won a big lottery after he choose his pet Korat’s show entry number for the lottery ticket. 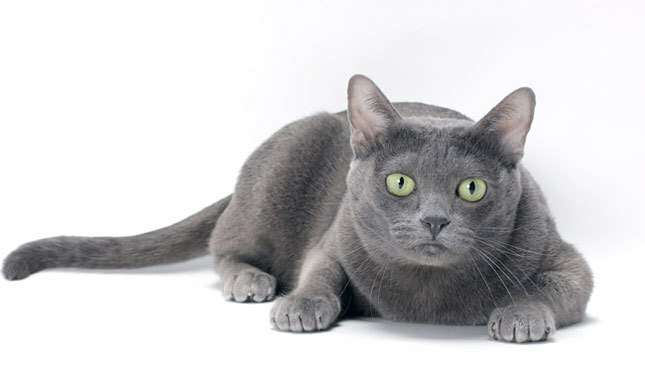 The korat cat is considered one of the purest breeds of today, resembling its wild ancestors from the Malay Peninsula. These cats have never been bred with other cat breeds because of the beliefs the local Thailand people have for them. Published on March 24th 2015 by Shiloh Nevada under Thai Cats. Article was last reviewed on 26th May 2017.